I’ve written a number of posts on this site about saving for retirement. This time let’s turn it around and discuss 5 steps to a lousy retirement. This tip is timely as major stock market indexes are at all-time highs. In fact one company, John Hancock recently ran a TV ad encouraging investors who had been on the sidelines during the current market rally to get in now. The commercial depicted upscale couples sitting in their financial advisor’s office with a sense of optimism about the markets and feeling like this is the right time to invest. Don’t get me wrong, I have no idea where the stock market is going from here, but four years into a major Bull Market is not the time to be thinking about just getting back into stocks. A better approach is to have a financial plan that includes an appropriate investment allocation for your situation through the market’s ups and downs. Whether proprietary mutual funds offered by your broker or registered rep’s employer or mutual funds with expensive loads, these funds are generally bad choices for most investors. While no financial advisor works for free, unless there is some overriding reason to the contrary it is generally a good idea to avoid these mutual funds. 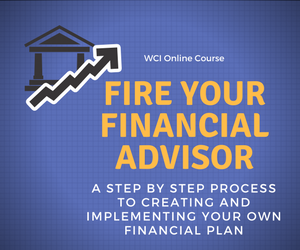 Rather look for a fee-only financial advisor who sells their advice and expertise and isn’t dependent upon commissions and trailers from the sale of financial products. This type of structure lends itself to utilizing low cost index funds and actively managed funds across the whole universe of fund families. It is said that fear and greed are the two most potent forces that drive the stock market. Many financial products, especially many annuities (including Equity Index Annuities) are sold by fear mongering sales types with retirees and Baby Boomers as their prime targets. An annuity might be the right answer for you, but don’t write a check until you review all the details of this or any financial product. Don’t buy into the doom and gloom scenarios pitched by many financial sales types, especially right after a market decline such as the one we experienced in 2008-09. Make financial decisions with a clear head, not out of fear, greed, or any other emotion. Why contribute to a 401(k) plan, 403(b), 457, or similar retirement plan offered by your employer? It’s much more fun to spend the money on things you want now such as clothes, a new car, that vacation you deserve, etc. Besides, didn’t 401(k) plans let investors down in 2008-09? The reality is that your employer sponsored retirement plan is one of the best retirement savings vehicles going. Even a lousy 401(k) plan is generally worth funding at least enough to receive your employer’s full match if one is offered. Over the course of my years as a financial planner I can tell you that I have many clients who have accumulated (or are in the process of accumulating) significant sums in their retirement plan accounts that will play a key role in their retirement. Why spend money on a financial plan? Retirement will just happen and I’ll be ready. Things have always worked out for me. The reality is that retirement is a financial journey, both accumulating enough for a comfortable retirement and managing your money during retirement. While you might win the lottery or inherit a princely sum from some long lost relative, the reality is that a successful retirement takes planning. As the legendary golfer Gary Player once said, “… the more I practice, the luckier I get…” The same applies to preparing financially for retirement. Planning, preparation, saving early and regularly, and your good common sense are all key elements in engineering a successful and comfortable retirement. Please contact me with any questions you may have or with any thoughts or suggestions about anything you’ve read here at The Chicago Financial Planner. Is Fear the Ultimate Financial Sales Tool? Reverse Churning Are You a Victim? That’s indeed a lousy retirement. Sure, just wing it and come what may right? Not the right kind of attitude I would suggest. I want to have a stress-free retirement. And I agree with your that a successful retirement needs thorough planning and hard work. Thanks for the comment and I totally agree with you. I cannot believe how many people who do not have a retirement fund at all. Most of the people at Mr. FBS’s company don’t have any sort of retirement at all. I thought maybe they all had an IRA, because the company doesn’t match, but no they have nothing. It’s sickening to think what might happen to these people in the future. Thanks for your comment. After so many years in this business I too am still amazed. These are good points. The first however is questionable as you put it. Nobody knows where the market is going but 4 years into a bull is not a good time to put all your eggs into the basket. Alan thanks for your comment. Leave to Wall Street to try to encourage folks to buy high and …. Roger, was this written tongue-in-cheek? Yes, a nice article How NOT to manage your future. You’re right – there are so many articles on how to achieve a retirement goal. The problem is that the vast majority of Americans are not doing much at all to improve their financial future. Thanks Suzanne it was somewhat tongue-in-cheek, but the point was still to help outline some steps folks should take in planning for retirement. I like this. It reads much like one of those commercials that poke fun at couples’ lack of asset allocation in their investments. They just throw things together that sound good at the time, occasionally add to them and then check it out when they’re ready. And they’re surprised things don’t look as good as they excepted. It would be funny, except these are real people’s lives. Thanks for the comment Scott. You are totally correct it would be funny except that I see much of this way too often. These are all great! Even though they sound so dumb when you read them, I know many people actually believe most of these points. I am always amazed at how many people are neglecting planning for their retirement. I’m only in my mid-twenties, but even I understand that I need a plan in order to eventually retire (even if it’s 40 years away). Jake thanks for your comment. You have the greatest retirement planning asset of all at your age, time. I suggest that you save as much as you can and increase as your salary rises. Great post. Interesting discussion regarding Retirement Thanks.You offer a great number of good points here. Keep up doing that and more and more guys will pay attention to your blog. I mean, what you say is fundamental and all. However just imagine if you added some great graphics or videos to give your posts more, “pop”! Your content is excellent but with pics and clips, this site could definitely be one of the very best in its niche.